A Devine Luncheon – WHAT IS JAMES WEARING? I do love a luncheon served al fresco in a glorious garden setting, and my super-chic friends Michael Devine and Thomas Burak offered exactly this at their lovely country home. Needless to say, I quickly had my outfit sorted out and train tickets purchased. With 25 x 120 feet to work with, they’ve managed quite cleverly to create the illusion and feel of a much larger plot. Its formality, Devine says, draws inspiration from the gardens at the Rodin museum in Paris. Our garden table was set with the most beautiful palette of lavenders, purples and cornflower blues punctuated with a crisp white table cloth and lavender napkins. This all to accommodate Devine’s delicious menu, with many of the ingredients harvested right on the spot. We were treated to a chilled gazpacho, followed by a salmon and leek tart with salad. We finished with an uber fantastic raspberry fool of sorts and lots of ice cold white burgundy. With such a lovely garden laboratory to work in, it might not surprise you to hear that Devine’s textile work owes much to these natural surrounds. 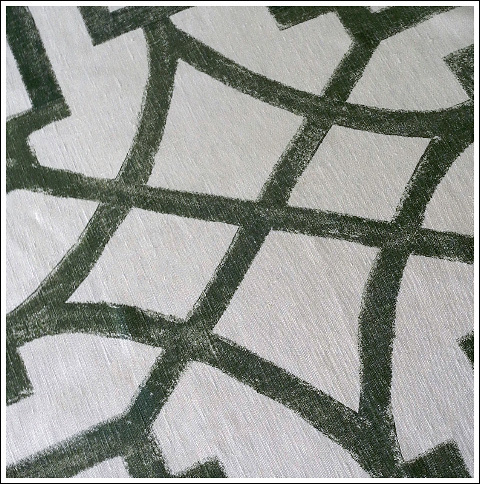 Take for instance the Michael Devine Home line “Fretwork” pattern—an impossibly fresh take on a treillage (it’s one of my favorites to utilized as, say, a curtain backdrop). Match it with a gorgeous floral chintz fabric, and you have a wonderfully luxurious interior garden. 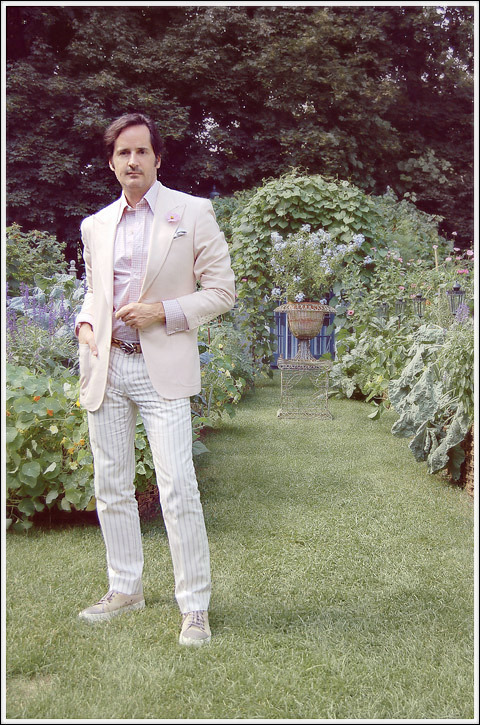 Enjoying the lovely garden setting, I’m sporting the palest pink silk jacket and lilac cotton over check shirt by Tom Ford, Charvet Paris pale gray silk pocket square, vintage moon stone cuff links, Gucci python belt with silver buckle and white and gray striped cotton pant, Lanvin sneakers and my fragrance is Iperborea by Lorenzo Villloresi. Posted in: Gucci, Lanvin, Tom Ford. I love Lorenzo Villloresi’s ‘uomo’ have you tried it ? Generally I find his stuff has good staying power which I have struggled with on some of the Creeds I have sampled. No I have not yet tried “uomo” but I will test it out next time I visit the boutique. The bleached out pastel colours and lovely garden give this a 1930s Cecil Beaton feel. Sounds as though it was a delightful lunch James. James! qué guapo te ves, pareces sacado de una película inglesa! I love these pale tones…….it´s like the atmosphere in dreams…….in a world behind the mists, like Avalon……. That is exactly the affect I was going for in this image. I was very inspired by the stills from Madonna’s upcoming film W.E. Dieses Foto von Dir ist ein Traum! What to wear for Irene?